Bring your friendly neighborhood Spider-Man to your wall with this Classic Spider-Man Comic Wall Decals by RoomMates Decor! Designed with official Marvel art, this giant Spider-Man wall sticker takes a Marvel themed-room to another level! 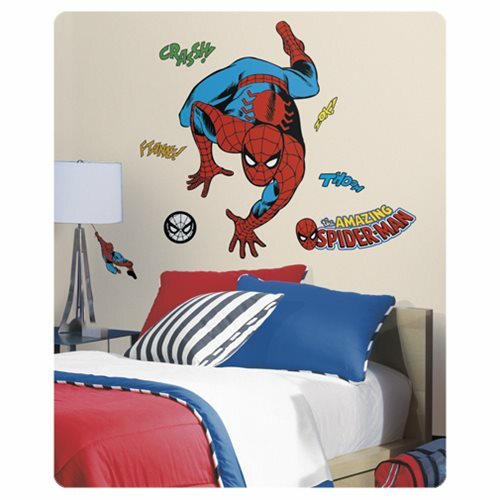 Complete with 23 wall stickers that easily assemble to form a giant image of Spider-Man, dedicate any wall or flat surface to your favorite Marvel superhero! Removable, repositionable and reusable, add these Classic Spider-Man Comic Wall Decals to your wall today! Measures 34 1/2-inches tall x 21 1/2-inches wide when complete.